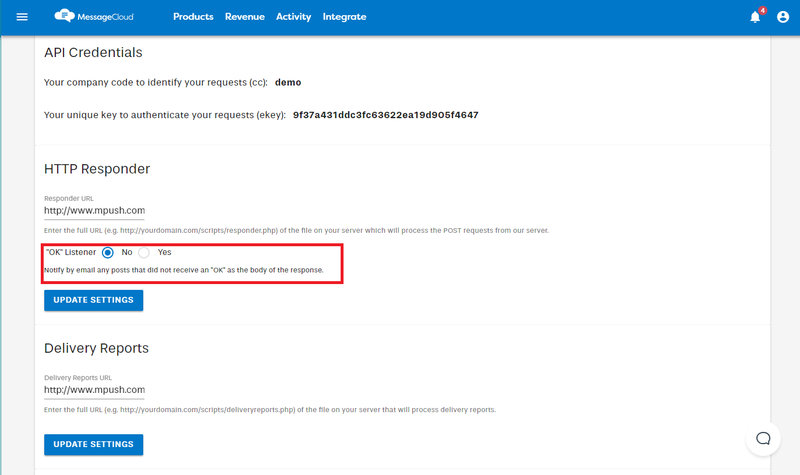 If you choose to purchase a shortcode or a long code then you will be sent messages from your consumers to the endpoint that you set up in MyMessageCloud. Take a look at the Getting Started With Gateway page if you need help with this step. The type of notification being sent to you. In the case of receiving a message, this field will always be mpush_ir_message. The unique message ID as assigned by MessageCloud. If you intend to reply to the message then you should store this value and send it to us in the id parameter during the Sending a Message process. The telephone number of the consumer who has sent an SMS to your short or long code. This number will always be in the MSISDN format. The originating network of the consumer. All mobile networks are assigned a unique network identification string by MessageCloud. As with the id parameter, this value must be used in the reply to us when attempting to send a premium SMS to the consumer. The contents of the message that was sent by the consumer. The shortcode or long code that received the message from the consumer, if available. The 2-digit country code from which the consumer originates, if available. For example, ES, IT, BR. See http://www.iso.org/iso/country_codes/ for more information. The network billing type, if available. For example, MO, MT, DC. What happens when I don't accept a message? MessageCloud offers a retry process for any messages that are not accepted by your endpoint. To be accepted, your server should reply with an HTTP 200 OK status along with an OK in the body of the response. If your server does not respond as expected then we will send automated emails to you informing you of the errors. This check can be switched on or off in the MyMessageCloud control panel. After the 5th attempt, the message is dropped and will no longer be retried.